SCVHistory.com TLP1702 | Tataviam Culture | Dolores Cook & Valentine Biscailuz: Marriage License & Cert., 1917. Dolores Cook & Valentine Biscailuz: Marriage Cert. Marriage license and certificate, Jan. 31, 1917, for Castaic native Dolores Cook (1890-1922); and Valentine Biscailuz (1893-1946), cousin of future Los Angeles County Sheriff Eugene Biscailuz (Valentine and Gene's fathers were brothers). The couple was married at Holy Cross Church, Los Angeles, by Fr. Roger O'Shea, a Catholic priest. Witnesses were Dolores' brother Theodore W. Cooke of Newhall (1887-1965) and Theodore's wife, Clara Biscailuz Cooke (1890-1970). This is about the time the "e" was added to the family surname; note that Dolores is shown as Cook while her brother is shown as Cooke. Dolores' parents were (Mr.) Dolores Cook and Francis Olme; both parents were of half-native (Los Angeles area) and half-European ancestry. 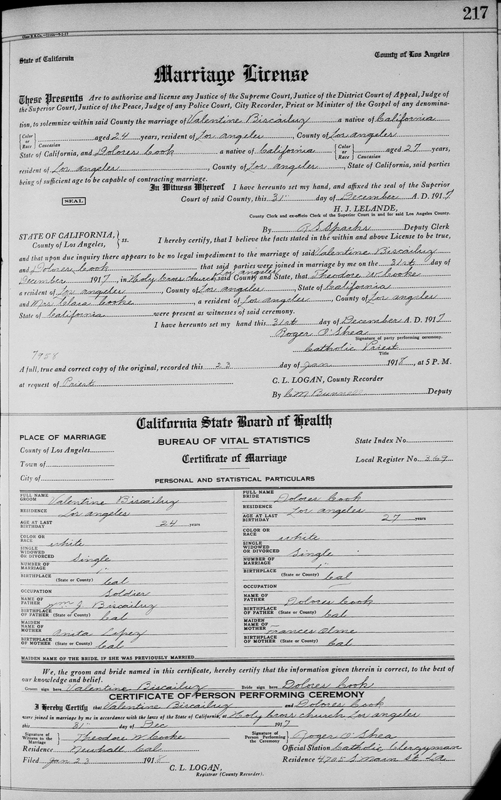 Here, Dolores' race is shown as white; her death certificate lists her as Mexican, which is incorrect. Dolores was born just one month before her father was murdered in Castaic (Feb. 28, 1890). Less than three months later, her mother was swindled out of their land in Castaic, where they had lived since 1882. Valentine's occupation is shown as soldier and his race as white. His father, William J. Biscailuz, was French-Basque; his mother, Anita Lopez, was a member of a prominent Californio (Spanish California) family (probably related to Jose Maria Claudio Lopez, a soldier at the San Gabriel Mission, but we need to check this). Anita was a sister of Tillie Lopez, who was a suspect in the death of her husband in Newhall in 1906. It was ruled a suicide. Valentine's maternal grandfather was also named Valentine (Valentine Lopez). One final connection: In the year his evenutal daughter-in-law was born, William J. Biscailuz was called as a character witness in the trial stemming from her father's murder, but his testimony went unheard. According to the Los Angeles Times (June 14, 1890), "W.J. Biscailuz of San Fernando met Dolores Cook seven or eight times. He was not acquainted with the people very well in the neighborhood where he resided. He was not allowed to testify as to Cook's reputation." TLP1702: 9600 dpi jpeg from smaller jpeg.